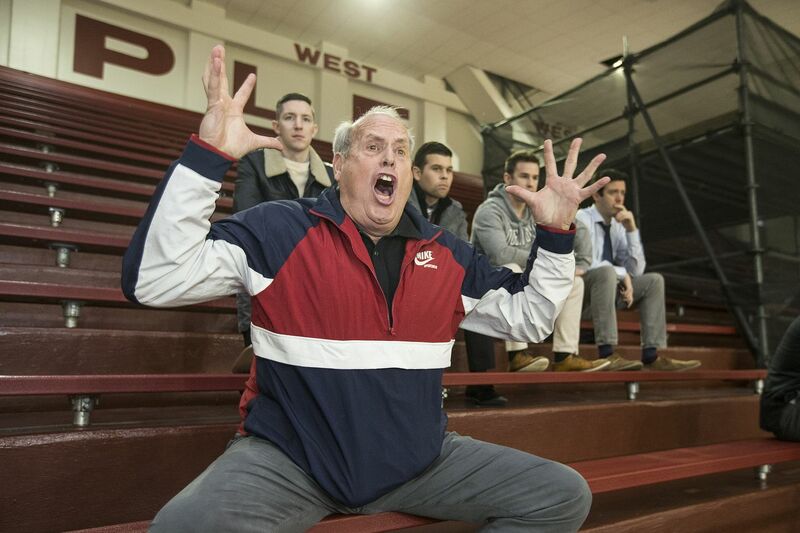 Mike Arizin, a son of late Philly basketball great "Pitchin' Paul" Arizin, channels his dad's passion during games at St. Joe's Prep, where his own son and nephew play hoops. I’m warned not to sit next to Mike Arizin at basketball games. “You can’t," says his brother Chris Arizin, 52. “He gets too fired up." Mike, 65, has come to this Catholic League playoff game at Temple University with low expectations. He looks content, his deep voice is calm. He believes this game will be the last time his son, Gabe Arizin, 18, and his nephew, Christopher Arizin, 17, both teammates on St. Joseph’s Prep basketball team, will play together. Their opponent, Roman Catholic, is that good. “This game’s going to be a little bit more relaxed for me,” Mike promises. Chris Arizin nervously checks the scoreboard during the St. Joe's Prep Catholic League playoff game against Roman Catholic. I join Mike as he slides into a bench in section 205 of McGonigle Hall. It’s just the two of us, with a couple of men a few rows up. His wife, Pat, leaves him to sit with Chris and Chris’s wife, Joann, because she won’t sit with her husband, either. During warm-ups, Mike waxes nostalgic about his family’s hoops legacy. In a city that loves an underdog, none had a more unlikely path to stardom than his late father, NBA Hall of Famer Paul Arizin. “Pitchin’ Paul” played 10 years with the Philadelphia Warriors, averaging 22.3 points per game. The forward made the All-Star team every year he played and retired only because the team moved to San Francisco. Few saw that type of career in Paul’s future, or any career in hoops at all. After high school graduation, Pitchin’ Paul enrolled at Villanova University while continuing to play basketball on local playgrounds and in Catholic Youth Organization leagues. The summer between his freshman and sophomore years at Villanova, Paul organized a team of “five goofballs off the corner,” Mike says, and entered a local tournament against college teams. According to legend, then-Villanova coach Al Severance was blown away by the skills of the young sharpshooter and suggested he enroll at the school. “I’m there already,” Paul told him. Paul’s Villanova No. 11 jersey is now retired. He once scored 85 points in a game for the Wildcats, and during his 1949-50 senior season was named the Sporting News college player of the year. An image of basketball great Paul Arizin, who starred for Villanova and the Philadelphia Warriors, is displayed at Finneran Pavilion on Villanova's campus. Paul was friendly with Wilt Chamberlain, the most famous of Philly’s basketball legends. But Wilt’s legacy in the Arizin family is about more than basketball. In 1993, Mike’s daughter Stephanie, then 12, wrote Wilt, asking for an autograph. Wilt didn’t see the letter for a few years, but when he found it, he called Stephanie to apologize. Stephanie, who by then was 16 and dying from an inoperable brain tumor, didn’t tell Wilt about her illness. She was too excited, says Mike, who soon told Wilt about Stephanie’s diagnosis. Mike, who stands 6 feet, 5 inches, played for La Salle, and says he was “never afraid to shoot.” Chris played for Drexel. Their own sons were little when Pitchin’ Paul died in 2006, but his competitiveness appears encoded in the Arizin DNA. After tipoff, Gabe drains a three-pointer, then claps his hands after taking a hard foul that knocks him to the floor. Just before halftime, he lobs a long pass to his cousin Christopher who cuts in and dunks. The Arizin cousins play for St. Joe's Prep. They are the grandsons of the late basketball hall of famer, Paul Arizin, who stared for Villanova and the Philadelphia Warriors. Gabe Arizin, 2nd from right, and beside him Chris Arizin huddle up with their team before the Prepâ€™s Catholic League playoff game against Roman Catholic on Feb. 15, 2019. Christopher Arizin (center) battles for the ball during St. Joseph's Prep’s Catholic League playoff game against Roman Catholic in February. His cousin Gabe Arizin is on the left. The Prep goes ahead early but as the lead volleys back and forth, one voice rises above the din of the raucous crowd. Hope is now driving Mike Arizin crazy, and people are staring. Mike picks up his Pepsi bottle to tighten the lid, only to put it back down. Then he reaches for it again and tightens the lid even more. When shots arch through the air, he leans into me, spreading his arms out as if he were still on the court, awaiting a rebound. No family member will sit with Mike Arizin at St. Joseph's Prep games. “He gets too fired up," says his brother Chris. I head to section 103 for the rest of the game, joining Chris and Joanne Arizin and Mike’s wife, Pat. The seats are crowded and quieter but as Roman Catholic pulls ahead, Chris sounds a little like Mike as his own competitiveness comes through. “You might be bringing us some bad mojo in this section,” he tells me, only half-joking. At halftime, St. Joe’s is down 26-23. When the third quarter ends, the Prep is up 42-38. Roman Catholic presses hard in the fourth quarter, however, and goes on to win, 55-50. Afterward, Pitchin’ Paul’s sons stand on the mezzanine on the south side of the court, both surprised at how well their own sons’ team had done. The Arizin cousins play for St. Joe's Prep. They are the grandsons of the late basketball hall of famer, Paul Arizin, who stared for Villanova and the Philadelphia Warriors. Gabe Arizin, center, walks off the court after Prep’s Catholic League playoff loss against Roman Catholic on Feb. 15, 2019. It was the final basketball game of his high school career. His cousin, Chris, is in the background right. “Nobody thought it would be this close,” Mike says. Mike and Chris embrace their boys, then switch to embrace their nephews. Gabe Arizin, 18, says he can’t believe I sat with his dad during the game. “You’re a saint!” he tells me. Both boys say they don’t remember their grandfather all that much. But they’ve seen his clips on YouTube. In September, Gabe will move on to the University of Richmond. Cousin Christopher will be a senior at the Prep, the last Arizin playing in Philly. For now, anyway. His little brother, Joe, 12, plays ball, too. Chris Arizin hugs his son Christopher after St. Joseph's Prep's Catholic League playoff loss to Roman Catholic.